Another round of Curious City questions: Curious how all this works? Logan Jaffe is the Curious City intern. It's a BYOV operation (bring your own View-Master). 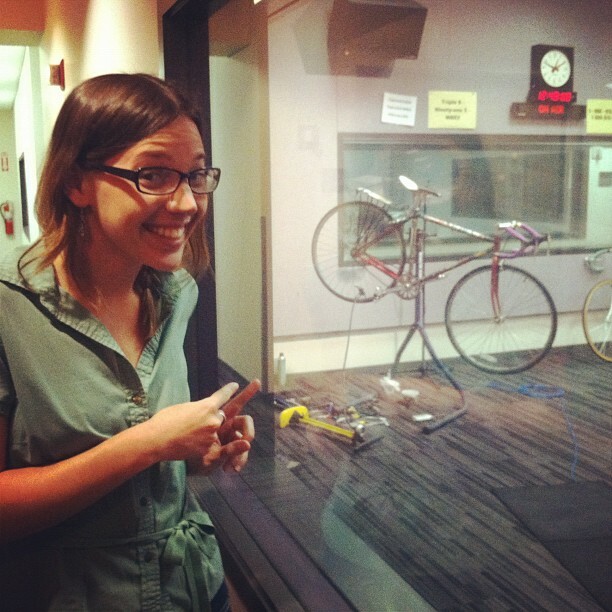 My bike makes its public radio debut with an on-air tune-up to help promote bike-to-work week. Welcome. Well, Curious City has officially gone through two rounds of voting. That means you submitted your questions about Chicago, the region, and the people who live here, we picked some for voting and, most importantly, you voted on your favorites. Within a week of Curious City’s launch, we received about 50 questions. The next week, that number almost doubled. We’d like to thank you for that of course, but figure it’s worth walking you through a bit more of what goes on behind the scenes. After all, Curious City is our collaborative experiment in openness and transparency; you can understand your half of the partnership here, but how are we making decisions on our end? I arrived pretty much at the start of a voting period and would be glad to walk you through it. It’s my second day at WBEZ. We’re in the swing of tallying votes for questions and the first round closes around 4 p.m. Katie Conrad from St. Charles won the round with this question: "Are there actually tunnels Al Capone used underneath Chicago, and if so --where are they and to where do they lead?" We give her a call and tell her the good news. She sounds pretty excited, especially about our invitation to explore Chicago and St. Charles, her hometown, by way of underground tunnel. She tells us she’s been curious about the tunnels since she was a kid. To her (and probably to most people in the Chicago area), Al Capone’s secret tunnels are more than a curiosity: they’re a legend. There’s also a catch. Earlier that day, WBEZ news producer Alex Keefe agrees to report on the Capone story. When we tell Katie who the assigned reporter is, a lightbulb clicks on in her head. Wasn’t someone by that name on her high school newspaper staff? Could it be the same person as the WBEZ reporter assigned to investigate her question? Indeed it was, and we laugh at the coincidence and decide to hold off on telling Alex until he’s in the recording studio. Scale. How long would it likely take to answer this question? Do-ability. Is this the kind of story that WBEZ could reasonably take on? Balance. Is the question fair, or does it presuppose an answer? ​Why we chose it: WBEZ has yet to cover this topic. It involves a community that gets little coverage, and it has potential for historical and cultural relevance. Plus, we have some good leads. We know there were Native American residents and community organizations on Chicago’s North Side, where we have a bureau and a reporter. Also, the question has potential to get at an overarching theme: If there aren’t actual descendants we can talk to, in what ways is this history still alive? What happened? Meigs Field Airport closed in 2003. What have been the economic effects? ​Why we chose it: It’s time for a Meigs Field update. WBEZ hasn’t reported on the story since 2005. The “closing” of the airport is still a sore spot for some Chicagoans and there’s an opportunity to talk about people as well as money. Plus, the question is completely balanced. Part one of the question is a fact. Part two is an invitation to investigate it. We’re all for it. Perhaps most important is that this question’s theme echoes the first one’s nicely. While the question about Native Americans addresses living history, this question addresses “dead” history. There is definitely no Meigs Airport, but there is an aftermath. We investigate and follow up after the fact. What&apos;s the history behind signs advertising businesses as "black-owned?" Do these signs hold weight in the community and influence purchases? Why we chose it: Not only does this question fit the theme flawlessly, it asks us to examine the past in light of today. This history is definitely “alive.” There are, in fact, “black-owned” business signs throughout the city, but their weight in the community is unclear. Also, the first part of this question hones in on a singular thing — the signs — while the second part expands the question to address the present. There’s potential for solid reporting as well as storytelling. So, we have three questions, each with different historical weight and relevance. In our book, that strikes a good balance. But, that’s just our argument. What do you think? Is all history “living,” or can parts of it be more “alive” than others? How should we weigh each question’s impact? In the afternoon, we grab Alex Keefe, the WBEZ reporter assigned to investigate Katie&apos;s question, for an in-studio interview on his plan to begin reporting. Turns out, he is also interested in Capone&apos;s secret tunnels; he once worked at a Starbucks in St. Charles and swears there are secret doors in the basement. After the interview, the Curious City team starts planning on how we will tell the story, too. Should we shoot video? Would an audio-slideshow better suit the theme? Today I also post a great offer on Facebook and Twitter announcing the first person to CALL in their question will get a free tin of Garrett&apos;s Popcorn balls. It is now Thursday of the week AFTER the post and no one has called. Doesn’t anybody like popcorn around here? We like to have questions curated and selected in time for the next voting round, so Shawn, Jennifer and I discuss which could make a good fit. 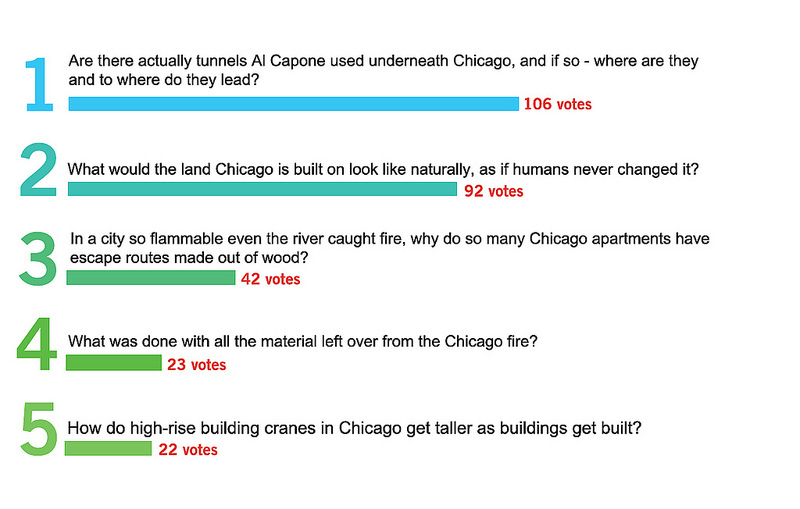 We settle on three that might balance the lighter tone of the last question that won — the Al Capone tunnels story. We settle on “transportation” as a theme, because there are several questions that deal with lore behind roads and expressways. Beyond the criteria we used before, we consider another: geographic diversity. Are different parts of the region being represented? We close the second voting round by letting the math decide. Our winner is Gerard Fleming, of Orland Hills. We call him to break the news. And … we finalize our assignment of the Native Americans story to our North Side reporter, Odette Yousef. Jennifer begins a new Timeline. A new round is in the works.